The homelessness of many people on the street is not merely a lack of housing. Society puts many demands on people, often excluding and refusing to accept those who do not conform to the rigid standards deemed as normal. The Simon Community accepts people for who they are, rather than trying to tell people who they should be. When we make contact with homeless people we do so on their own terms and aim to live with them in a philosophy of love, tolerance, acceptance and self-help. For this reason we do not seek to rehabilitate people, but to give them the opportunity to think about their lives, what they want and provide them with some choices. The theory underlying our work is that many people end up on the streets as a result of damaging life experiences and have difficulty making relationships work. They often have unrealistic expectations of themselves, other people and social structures. We therefore believe that helping people move forward from homelessness and the social exclusion that accompanies it is not just about providing accommodation. It must include helping people build stable relationships and achieve a sense of belonging. Hence the importance of working as a community. 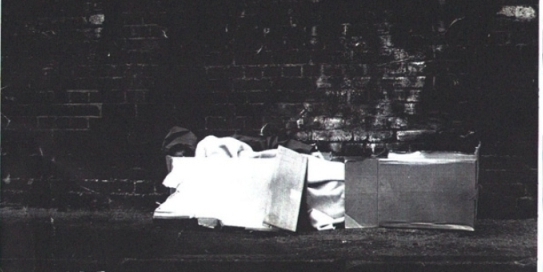 Why do some people choose to sleep rough when there are hostels? Surviving life as a homeless person on the streets of London leaves little time for thinking of a way out. Finding food and shelter, avoiding violence, coping with ill health and loneliness can take all of a person's energies. A bed in a traditional hostel will provide temporary comfort, but it alone is not the answer. For some, hostel rules and regulations can contribute to their sense of powerlessness. For others, bad experiences of hostel life have led them to prefer to take their own chances on the street. Should I give to beggars? Whether or not you give to beggars is an entirely personal choice. What may be more important is to consider that many homeless people have not had any positive human contact for some time and they are likely to be feeling vulnerable, isolated and ignored. Remember that they are people just like you and at least take the time to acknowledge their presence.